Is that even the correct way to spell it? I have a decent amount of glass, but it is hard to really see what I have. despite my attempts to organize, as soon as I pull glass for piece, it is like a bomb went off in the shop and garage. 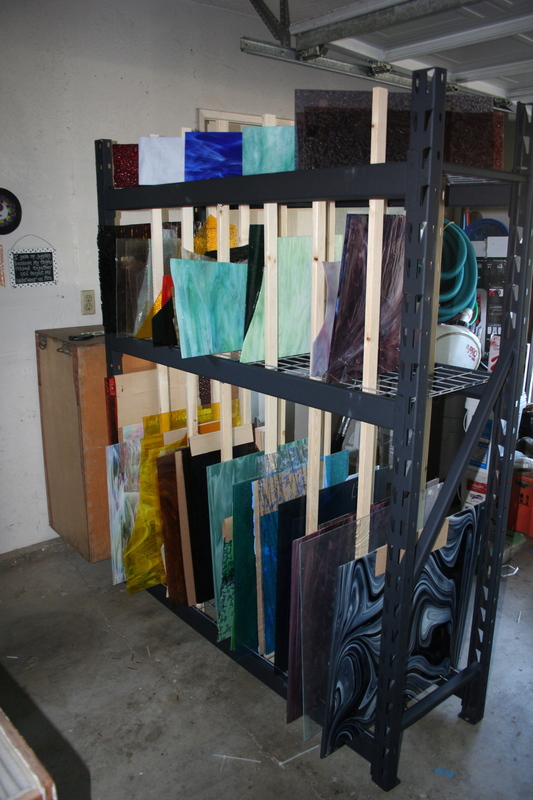 I have sheets of glass leaving against walls, shelf units, the crates I store them in in the garage. At some point, disaster will strike. 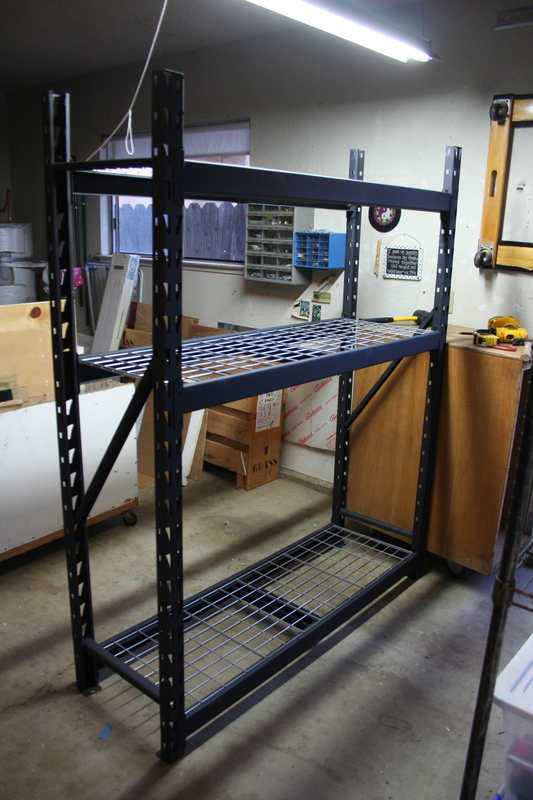 I saw a fantastic rack in another workshop, built of industrial shelving, tall on the bottom, with a med sized shelf on the top. Loved it. I searched the internuts, trying to find reasonably priced shelving int he size I need, which is 24″ deep, and i need to be able to get a 40″ piece of glass on the bottom rack. Especially if i go ahead with my plan to wholesale. The other issue was light penetration. Most of these racks are floored with particle board. This baby is a wire grid shelf. I placed it under the existing daylight fluorescent, and viola!! no more pulling a piece all the way to see what the color really is. I wasn’t going to load it. really. I wasn’t. I bought a $6 pack of furring strips, cut them to 6 ft, and zip tied them to the grid as dividers. something smaller would have been nice, but the price couldn’t be beat, lol. Very pleased with it. The top shelf holds the long, narrow pieces (4-6″ x 24), the ones that are forever getting lost, but when you need one, you really need one. I had the brilliant idea to put them at an angle, otherwise, I am afraid at some point a very bad thing would happen. of course, now I want another one. Maybe someday. After I discover a cashe of Gold Rush era uncirculated gold coins buried in my back yard. ~ by kellig on June 17, 2014. That looks really great Kelli. Furring strips to make dividers is genius. Thanks denette! I am crazy happy with it. Loaded the rest of the glass in it this morning. It looks so purty, lol.